“We’ve come a long way, haven’t we?” – Felicia Day, introduction. Since launching in 2007, the comedy web series The Guild has become an Internet phenomenon, with over 150 million views. Created, written by and starring Felicia Day, it follows the story of a Guild of online gamers who finally meet in real life. Here at last is the official companion to the show that fans have been waiting for, featuring an intro from Felicia, in-depth interviews and scores of photos. As we all know companion books are a lot of fun and a must for diehard fans. However, this book is in a sense different as it doesn’t just chronicle the journey of any average TV show, it tells the story of how a web series is created. In this companion Felicia Day tells her fans in great detail how she made this series and the in-depth interviews and reflections of the staff and crew and it’s unlike anything you will find anywhere else. There is also a wealth of information from the people who made the series, lyrics for the songs and a section dedicated to the infamous Cawkes Painting. Ultimately, this is a piece of fandom. It’s hard to imagine anyone who’s not already into The Guild being tempted by an official guide. It also feels very much like a gift you get for someone else it works as a gift because it’s lovely to look through; it’s colourful and packed with pictures. The page layout is scrapbook-like in style and effective as it means you can glance down at a page and feel like you’re glancing at a moment in time for The Guild’s history. This companion is truly a must-have for any The Guild fan, or anyone curious about the process of creating a web series. Amy is a founding member of the psychopathic clowns and the women who love them society. From the mystical land of dragons and druids also known as Wales, she can often be found buried under a pile of books in her own personal bat cave. However her lifelong ambition is to gain entrance to Arkham Asylum either as a doctor or patient (more likely the latter). 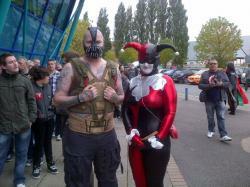 Although like her alto ego Harley Quinn she is a qualified criminologist with a penchant for homicidal personalities.